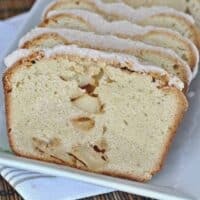 Rich, buttery, cream cheese Pound Cake filled with chunks of Apples. Take it to the next level with a Cinnamon glaze! 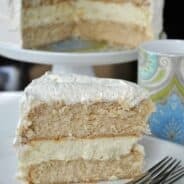 I sure hope you aren’t tired of the apple recipes this week! 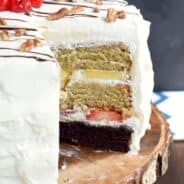 It was so much fun trying to incorporate apples into all my delicious desserts. 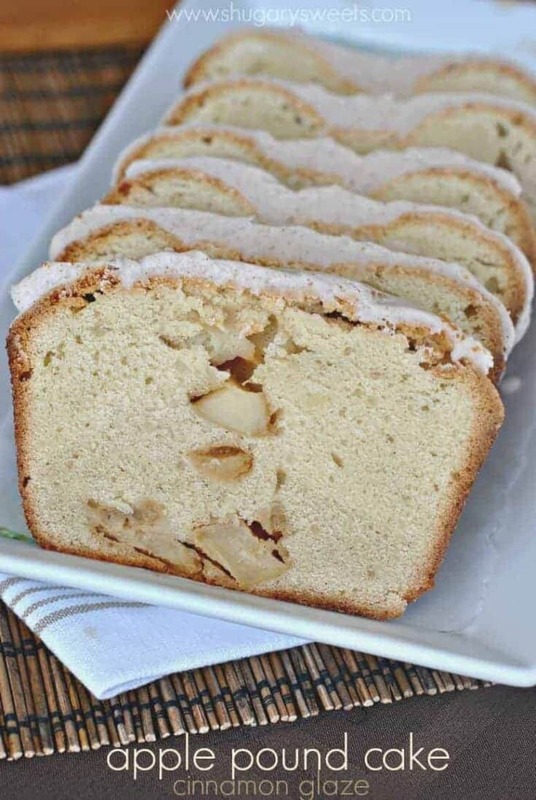 Speaking of dessert, raise your hand if you LOVE pound cake! 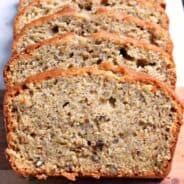 I pretty much can slice myself pieces all day long until before I know it the whole loaf is gone! Today’s recipe was no exception. I started with my favorite pound cake recipe and altering it slightly I added in some diced Crunch Pak apples. But, if you’ve been reading my blog for any period of time, you KNOW I can’t stop there. I topped this loaf of apple pound cake with a sweet cinnamon glaze! Or is it icing? Seriously, what’s the difference. It was covered in a smooth frosting, k? And then I ate the whole loaf in 2 days. No. Joke. Good thing this recipe makes TWO loaves of pound cake. I was able to wrap the second loaf in foil and a ziploc and get in the freezer before devouring it! 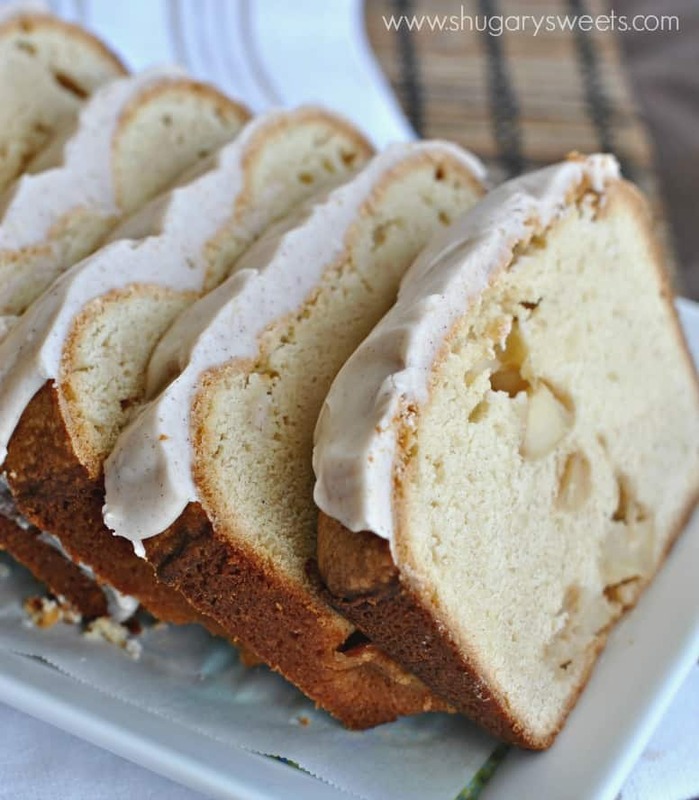 Be sure to stop by Jocelyn’s blog today for her Caramel Apple Bundt Cake recipe! Sharing Apple Week with her has been a treat. Although it would have been better if I had sampled her recipes! ya know? In a large mixing bowl, beat butter and cream cheese until smooth (about 3 minutes). Add sugar, beating until fluffy (an additional 5 minutes). Add eggs, one at a time, beating well after each addition. Beat in vanilla. Turn mixer to low and beat in flour and salt. Fold in the diced apples. Remove from oven and coo in pans for about 10 minutes. Turn out and cool completely on a wire rack, with top sides up. For the glaze, beat powdered sugar, cinnamon and heavy cream with a whisk until smooth. Spread over completely cooled cakes. Store in airtight container. These freeze well too! *I like to line the bottom of my loaf pans with parchment paper as an additional step to ensuring the cake removes easily. **I use 8 1/2 inch by 4 1/2 inch by 2 1/2 inch loaf pans. ***Lightly place a piece of foil over the tops of the loaf pans during the last 15-20 minutes to prevent burning. Check out my “Applicious Goodies” Pinterest board! We are huge pound cake eaters in our family! My mom ends up making 2 or 3 when we all get together because we just love it so much! I am so into this one with the apples and the glaze!! And here’s another show stopping apple dessert! You and Jocelyn are just outdoing yourselves. I would eat each and every apple recipe flying out of your kitchen! haha, thanks Marcie! I’ve got to keep up with Jocelyn, she is an incredible baker! This looks SO good! I love a good pound cake. YAY for apple week! I am loving apple week! 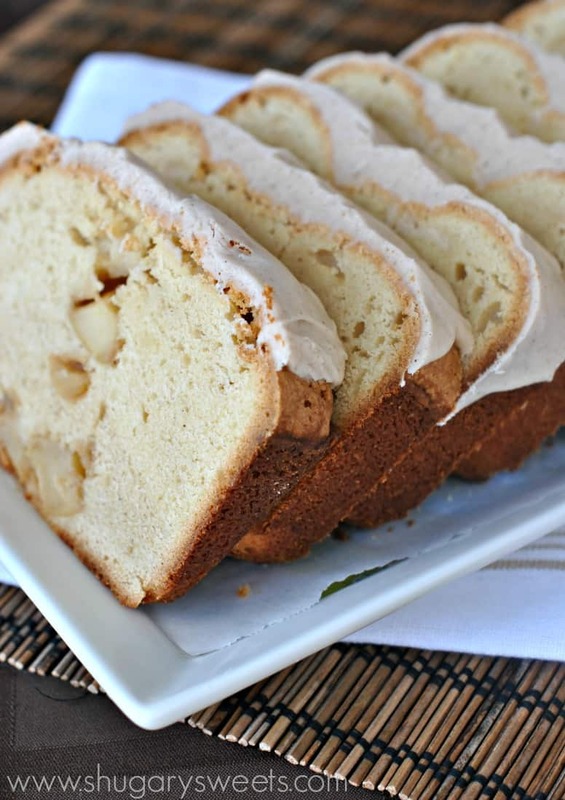 Apples in pound cake – gosh that sounds so good. This would be such a hit over here! Pinned! Thanks for pinning Mary Frances! Yum! I could really use a piece of that with my coffee this morning! This looks awesome, Aimee! I am loving apple week! I love this pound cake! Oh how I wish, that would be so fun! I will never be tired of apple recipes – I think if you wanted to dedicate the entire month of September to them, I would’ve been just fine with that heehee. 🙂 This pound cake looks absolutely perfect – I am drooling over that glaze! I love pound cake (who doesn’t) but I love that you dolled it up with so many wonderful flavors. I don’t think I could ever get tired of apple recipes. I wish I had a piece now for a mid morning snack! Ooh! Love all the big chunks of apple in there! I don’t think I could ever get sick of apple recipes, especially when they are in pound cake mixed with a cinnamon glaze!!! I love that you glazed this! YUM! I am the same with pound cake. So yummy! I love that you added some apple for fall. And well frosting. Pretty happy about that one too. can you use fresh rasberries? Is there something wrong with the glaze measurements? Mine is spreadable but def not drizzlable. And forget about the whisk! It’s way too thick.